I (Jeff) bought this house as an investment duplex when I was 20 and planned to buy more and move on. As time went on I refinished one room at a time. When I got married, instead of moving we turned the house into a single-family home. The house is great for entertaining. We turned the first floor into our office and entertainment floor, while we live on the second floor and have been turning the third floor into a guest suite. 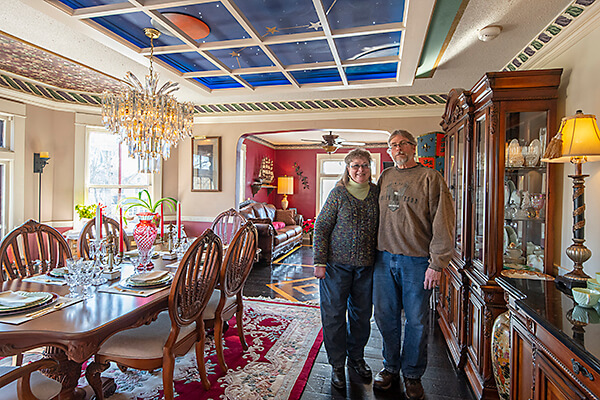 From a previous tour you’ll remember a fiber optic star ceiling in the dining room, lighted stained glass and coffered ceiling in the lounge with a bar, Minnesota Room, and music room with a player baby grand piano. The LED and fiber optic floor in the first floor bathroom is new. We’ve changed other elements as well.